"THE NEA TAPES" DVD with study guide materials is $325.00 plus $35 shipping and handling. Alberta College of Art & Design, Amherst College, Art Center College of Design-Pasadena, Art Institute of Atlanta, Art Institute of Chicago, Cincinnati Contemporary Art Center, Cleveland Institute of Art/Case Western Reserve, Columbia College-Chicago, Connecticut College, Cornell University, Cooper Union-NYC, Dartmouth College, Kansas City Art Institute, Maryland Institute College of Art, Parsons School of Design / The New School University, Reed College, Rhode Island School of Design, Sarah Lawrence College, School of Visual Arts-NYC, Smith College, Skidmore College, Swarthmore College, Vassar College, Wellesley College, Wexner Center for the Arts. "This is a pretty good government that can fund its dissenters, that has the self-assurance to know that all voices can be heard in a democratic society." Tim Robbins, actor / director, as quoted in “the nea tapes"
"It was frustrating.. I recognized pretty early on (that) it was a political game, maybe not in the first year but once I had gotten some response from some congressman on both sides of the aisle that said; Oh yes don't worry I am with you, but then they didn't vote with me. Then I realize there was something else going on." Jane Alexander Chairperson of the NEA 1993 –1997, as quoted in "the nea tapes "
"... It's just really incredible; and so important, and so necessary. Thank you for working so hard to liberate and save something that we all hold so dear." speaking about "the nea tapes"
"the nea tapes...wonderful...I think Paul and Melissa did a splendid job. I was quite amazed at how many different points of view were expressed." Jane Alexander speaking about "the nea tapes"
is an “oral history” of the 1990’s arts funding “culture wars"—increasingly worthy of preservation. There are 54 voices in the 60 minute film, edited from 300 interviews recorded across the US from 1995 to 2001. The film tells the story of diverse arts community support for America’s federally funded arts and humanities. It was the mandate of this film that this passionate oral and visual history be documented and retained. That said, this film provides an engaging platform for debate. Increasingly we are told that the " the nea tapes " is being used by faculty and librarians from many differing disciplines for their own research on the culture wars, the history of funding for culture and censorship. Also, numerous faculty and librarians have informed us that since the film bridges many disciplines, colleges have been able to resource different departments for funds for a purchase or visiting artist presentation.
" 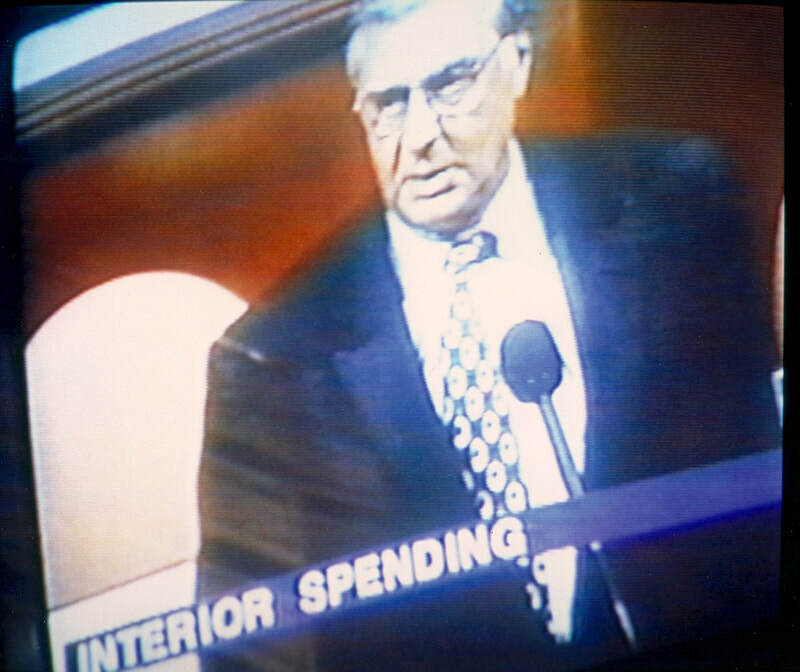 the nea tapes," as a work in progress, has been screened in the Halls of the US Congress; at the College Art Association and broadcast on John Pierson's "Split Screen" show on Bravo and on the Independent Film Channel.
" the nea tapes " provides the back story from the formation of the National Endowment for the Arts in 1965, through the battles over suppressed speech in the 1990's, to why censorship is escalating. It is a story about the capacity of individuals to actuate change through dialogue. The plethora of opinions expressed in the 300 interviews present a multicultural, demographic overview of the subjects at hand. While framing the funding of ART within the context of free speech, the film documents how censorship effects not just the contemporary artist, but society at large. Lastly, " the nea tapes " makes this complicated subject understandable and assessable by using personal stories of individuals to delineate the diversity of culture by example. The filmmakers, Paul Lamarre and Melissa Wolf traveled across the USA documenting and discovering (through 300 interviews) the major events and players in this conflict: Robert Mapplethorpe, Andres Serrano, Karen Finley, and the story surrounding the Brooklyn Museum and the Mayor of New York City. The "right wing" is also heard from; including Martin Mawyer, director of the "Christian Action Network" as interviewed while presenting a "degenerate art show" in the Halls of Congress. This is the story of two artists looking for the democracy and free expression through the diversity of culture.
" the nea tapes " (2001) is particularly applicable for students and faculty interested in: the fine arts, art history, interdisciplinary studies, sociology, communications, government, cultural studies, performance studies, journalism, media studies, gender studies, museum studies, political science and first amendment law. This one hour documentary can be presented in various ways: as private or public screening; with panel discussion; or to individual classes. The film can be used as a catalyst to activate, inform, inspire, and challenge students on the issues of arts funding and censorship in America. Also participating in " the nea tapes " are: the actors, Tim Robbins and Ed Asner; professor of linguistics at MIT, Noam Chomsky; attorney for the Brooklyn Museum, Floyd Abrams; playwright, Edward Albee; actor and former chair of the NEA, Jane Alexander; the artists - Chuck Close, Douglas Davis, Karen Finley, Andres Serrano, Kiki Smith, Fred Wilson; the late US Representative Sidney R. Yates, and many others, including Charlie R. Braxton; poet / playwright; Jackson, Mississippi. March 9-12, 2000 - screening and panel at ASU - Arizona State University, Tempe Performance Studies International (PSi 2000) Conference, Panelists: Tanya Augsburg Ph.D., bachelor of Interdisciplinary Studies Program, ASU, moderator; eidia, Paul Lamarre/Melissa Wolf, directors, the nea tapes; Tim Miller, performance artist, founding director, Highways, Los Angeles; David Olsen, Department of Communication, Cal State, Los Angeles and Sheree Rose, performance artist, Los Angeles. February 26, 2000 - screening and panel at College Art Association Conference, New York City sponsored by National Coalition Against Censorship. Panelists: Maxwell Anderson, director of the Whitney Museum of American Art; Ronald Feldman, Ronald Feldman Fine Arts (moderator); Alan J. Friedman, chair, Cultural Institutions Group & director, NY Hall of Science; Valerie Jaudon, artist, New York City; and Mary Miss, artist, New York City. February, 2000 - Zingmagazine, “Framing Aesthetic Research” article by Tanya Augsburg, about the the nea tapes. December 4-11, 1999 - screening at Millennium’s Neighborhood, Judson Church, New York City. December 9, 1999 - screening and panel at at the New York Society Ethical Culture, co-sponsored by New York Civil Liberties Union, The Nation magazine, National Coalition Against Censorship, and People for the American Way. Opening remarks - Norman Siegel, director New York Civil Liberties Union; Panelists: Arthur Eisenberg, legal director NYCLU; Katha Pollitt, columnist Nation Magazine; Christopher Durang, playwright; and Ted Berger, director New York Foundation for the Arts. November 11,1999 - San Antonio Current, “NEA-Saying On Tape,”an article by Steven G. Kellman reviewing the nea tapes screening in San Antonio, Texas. October 15, 1999 - screening at Finesilver Gallery, San Antonio, Texas. September 22, 1999 - screening in The Capitol Building Washington D.C., with introduction by US Representative Jerrold Nadler. September 24, 1999 - a screening at Filmmakers Collaborative New York City. September 18, 1999 - screening at MOXIE! the Santa Monica Film Festival, in cooperation with ARTS/LA, Bergamot Station Arts Center, Santa Monica, California. August 1998 - a six minute section the nea tapes (work in progress) was broadcast twice on Bravo and the Independent Film Channel; John Pierson’s Split Screen show, (reaching 16 million homes). January 1998 - the nea tapes (a work in progress) awarded the Soros Documentary Fund Fellowship. November 12, 1997 - Lecture and the nea tapes documentary (a work in progress #4) screening at Oberwelt e.v. Gallery in Stuttgart, Germany. November 7 - 30, 1997 - the nea tapes documentary and Eidia House Installation at Peripherie Gallery at Sudhaus, Tübingen, Germany. October 27, 1997 - the nea tapes documentary (a work in progress #4) screened at the Newhouse Center for Contemporary Art Snug Harbor by the Cultural Council on the Arts & Humanities for Staten Island. Candidates for Staten Island’s Congressional District; Vito Fossella and Eric Vitaliano, were invited to state their position on continued federal funding for the arts. July 1997 - the nea tapes documentary (a work in progress #4) screened at Clocktower, Institute for Art and Urban Resources presented by P.S. 1 Contemporary Arts Center. May 1997 - Article about the nea tapes in Swiss Newspaper “Neue Zürcher Zeitung.” The nea tapes at Art Exchange in digital Kiosk, courtesy Zingmagazine. April / May 1997 - the nea tapes (a work in progress #3) airs on Free Speech Television –31 cable stations, 31 states to 8 million homes. April 1997 - The exhibitionist magazine; “Assassination of the NEA or the Following is Not Funded by the NEA” by Paul Lamarre and Melissa Wolf; the nea tapes interviews transcribed as feature article. February 1997 - “The nea papers” by Paul Lamarre and Melissa Wolf; published in Zingmagazine. December 1996 - The New York Kunsthalle, screening of the nea tapes (Work in Progress, #1, #2, #3). September 1996 - The nea tapes (a work in progress #3) submitted to Congress. August 1996 - The Independent Film & Video Monthly, volume 19 number 7, article: “CREATING TOOLS FOR THE CULTURE WARS, the nea tapes and Artistic Freedom Under Attack”. April, 1996 - “National Endowment for the Arts Rescue Plan” article, about the nea tapes in Flash Art International art magazine. April 25, 1996 - Paul Lamarre and Melissa Wolf participate in “The Artist as Legislator”, A Town Hall Meeting sponsored by Movement Research and the Office of Manhattan Borough President, Ruth Messinger. April 16, 1996 - Paul Lamarre and Melissa Wolf participate in “Money for Art”, Panel discussion at Judson Church sponsored by PS 122. March 1996 - Airing of the first the nea tapes Public Service Announcement. January 10, 1996 - the nea tapes (a work in progress) presented at “Cyber Suds” a multi-monitor screening at the Technology Center, 55 Broad, NYC. Organized by Rudin Management Corporation. December 8, 1995 - Panel discussion, screening of the nea tapes (a work in progress #2) at PaceWildenstein Gallery, “WHY VOTE,” sponsored by 3rdWAVE, the Panelist were; Farai Chideya, Chuck Close, Bill T. Jones, Thelma Golden and Paul Lamarre. November 25 & 26, 1995 - Filming of Public Service Announcement, 25 interviews conducted outside four New York City museums with the “man on the street”. October 6-8, 1995 - the nea tapes (a work in progress #1 & #2) screened during the SOHO ARTS FESTIVAL, “The New Role of the Individual Artist and Politics,” at Holly Solomon Gallery, Printed Matter, Swiss Institute, Cristinerose Gallery, Thread Waxing Space and Lombard / Freid Fine Arts. Five hundred individuals sign a petition lending their names in support of the NEA, NEH, and IMS. September 29, 1995 - the nea tapes (a work in progress #2) presented at the New School for Social Research in meeting with Advisory Committee of the Vera List Center for Art+Politics. September 26, 1995 - Symposium: at the School of Visual Arts,”The Escalating War on Culture: the NEA, the Artist, and the Government”, including the nea tapes (a work in progress #2) and panelists Roger Kimball, Elaine King, Joseph Kosuth, Carole S. Vance, Suzanne Anker. July 12, 1995 - Symposium with the nea tapes, “The New Role of the Individual Artist in American Society”, at the Pollock-Krasner House, East Hampton with participants: Suzanne Anker, Sandra Edwards, Helen Harrison, Valerie Jaudon, Richard Kalina, Chris Kohan, Trudy C. Kramer, Paul Lamarre, Ron Morosan, Roy Nicholson, Jesse Rhines, and Melissa Wolf. May 1995 - the nea tapes receives sponsorship from the New York Foundation for the Arts. The first benefit and screening of the nea tapes (a work in progress #1) is held at Lombard / Fried Fine Arts. January 1995 - Beginning of the nea tapes; 43 individuals in the arts (New York City) are interviewed discussing the current arts funding crisis. Nicholas Drake - Disabled Person / Artist / Writer, Charleston, South Carolina Rev. Richard Feigen -Owner/Director,Richard Feigen Co.
Ronald Feldman - Owner / Director,Ronald Feldman Fine Arts Inc.
Kathy High - Video Artist / Editor, "Felix"
Rachel Rosenthal - Director, Rachel Rosenthal Company, Los Angeles,CA. Pauline Stella Sanchez - Faculty, Art Center Collage of Design,Los Angeles, CA. Jeannette Sorrell - Music Director, Apollo's Fire, The Cleveland Baroque Orchestra, Cleveland, OH.